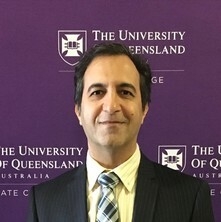 Dr Farhad Fatehi is a Postdoctoral Research Fellow at the UQ Centre for Online Health. He also holds a Visiting Scientist appointment at the CSIRO Australian eHealth Research Centre. In 2014, he completed a PhD degree in the field of Telemedicine, by evaluating the outcome of video teleconsultation (remote consultation using videoconference) for the management of diabetes, and comparing it with in-person consultation. He has published both original and review studies, and presented the results of his research in national and international conferences and meetings. Dr Fatehi has contributed to the development of a mobile-based diabetes management system which is currently under evaluation for saving costs and improving the efficiency of outpatient clinics of diabetes. In 2015, he was awarded an Early Career Advance Queensland Fellowship for investigating the feasibility and effectiveness of a mobile health application for diabetes management. His research interest includes evaluation of telemedicine, mobile health (mHealth), and eHealth applications for the management of chronic diseases and in particular diabetes. He is also interested in the development of innovative models of health care using modern information and communications technology. Dr. Fatehi has completed a series of research studies on situation analysis, needs assessment, implementation and assessment of telemedicine for the management of diabetes as well as other chronic diseases. The key areas of interest are enablers and barriers of successful implementation of telemedicine services in various heath care settings. Dr Fatehi has been involved in several projects on the development, implementation, and evaluation of mobile health applications (apps) in particular for chronic diseases. He is interested in evaluating consumers' perspective and feedback on mobile health apps. Through a series of research projects, I aim to develop, implement, and evaluate various interventions and new models of care based on IT and Digital Technolgy for diabetes care. The aim of this project is to identify how to gamify mobile health apps to improve their uptake and retention by people with chronic diseases and in particular diabetes mellitus. Ezoddini-Ardakani, Fatemeh, Navabazam, Alireza, Fatehi, Farhad, Danesh-Ardekani, Mohamad, Khadem, Somayyeh and Rouhi, Gholamreza (2012) Histologic evaluation of chitosan as an accelerator of bone regeneration in microdrilled rat tibias. Dental Research Journal, 9 6: 694-9. Gonzalez-Garcia, Manuel, Fatehi, Farhad, Varnfield, Marlien and Karunanithi, Mohan (2018). Challenges of a large multi-centre study on Mobile health for cardiac rehabilitation scross European countries. In: 18th Successes and Failures in Telehealth Conference (SFT-18), Darwin, Australia, (). 22-24 October 2018. Fatehi, Farhad, Farr-Wharton, Geremy, Ly Tong, Huong, Ireland, David, Wade, Victoria and Karunanithi, Mohan (2018). What users like and dislike about mobile apps for diabetes: a qualitative analysis of 5964 reviews on 57 Android mobile apps. In: 18th Successes and Failures in Telehealth Conference (SFT-18) Proceedings. 18th Successes and Failures in Telehealth Conference (SFT-18), Darwin, NT, Australia, (). 22 - 24 October 2018. Nazari, Elham, Ameli, Elias and Fatehi, Farhad (2017). Aggregation of Patients’ Data for Telemedicine Services Using Cloud-Based Solutions. In: 17th International Conference on Successes and Failures in Telehealth (SFT-17), Brisbane, Australia, (). 30-31 October 2017. Askari, Marzyeh, Niakan-Kalhori, Sharareh R., Ghazisaeedi, Marjan and Fatehi, Farhad (2017). Computer Software and Mobile Apps for Alcohol and Substance Abuse Treatment: A Systematic Review. In: 17th International Conference on Successes and Failures in Telehealth (SFT-17), Brisbane, Australia, (). 30-31 October 2017. Aslani, Azam, Agin, Fariba, Mirazimi, Hosnieh-sadat and Fatehi, Farhad (2017). Effectiveness of Mobile-Based Interventions on Smokers Health Behaviour Change: An Overview of Systematic Reviews. In: 17th International Conference on Successes and Failures in Telehealth (SFT-17), Brisbane, Australia, (). 30-31 October 2017. Aslani, Azam, Roozrokh, Mahsa, Hosseini, Elahe and Fatehi, Farhad (2017). Effectiveness of mobile-based interventions on health behaviour change in people with diabetes: an overview of systematic reviews. In: 17th International Conference on Successes and Failures in Telehealth (SFT-17), Brisbane, Australia, (). 30-31 October 2017. Hosseini, Nafiseh, Etminani, Kobra and Fatehi, Farhad (2017). Enhancing the Security of Web Sites and Patients’ Portals by Detecting Malicious Web Robots Using Machine Learning Techniques. In: 17th International Conference on Successes and Failures in Telehealth (SFT-17), Brisbane, Australia, (). 30-31 October 2017. Valizadeh-Haghi, Saeideh, Rahmatizadeh, Shahabedin and Fatehi, Farhad (2017). Middle East Respiratory Syndrome: Readability of Online Resources. In: 17th International Conference on Successes and Failures in Telehealth (SFT-17), Brisbane, Australia, (). 30-31 October 2017. Mosadeghi-Nik, Mahsa, Niakan Kalhori, Sharareh R. and Fatehi, Farhad (2017). Mobile health (mHealth) for chronic wound management: a review of the literature. In: 17th International Conference on Successes and Failures in Telehealth (SFT-17), Brisbane, Australia, (). 30-31 October 2017. Salmani, Hosna, Kazemi, Azar, Shakibafard, Alireza and Fatehi, Farhad (2017). New and Emerging Mobile Technologies for Healthcare (mHealth): A Horizon Scanning Review. In: 17th International Conference on Successes and Failures in Telehealth (SFT-17), Brisbane, Australia, (). 30-31 October 2017. Gonzalez Garcia, Manuel, Feenstra, John, Soderberg, Stefan, Varnfield, Marlien, Ding, Hang, Fatehi, Farhad, Karunanithi, Mohan and Yang, Ian (2017). The e-PAH Platform: A Novel Monitoring and Rehabilitation System for Patients with Diagnosed Pulmonary Arterial Hypertension (PAH). In: 17th International Conference on Successes and Failures in Telehealth (SFT-17), Brisbane, Australia, (). 30-31 October 2017. Zazo Hernanz, Virginia, Bjornfot, Patrik, Schimmer, Robyn and Fatehi, Farhad (2017). Working in Sweden from Australia: Using Robotic Telepresence for Leadership and Consultation in a Dermatology Department. In: 17th International Conference on Successes and Failures in Telehealth (SFT-17), Brisbane, Australia, (). 30-31 October 2017. Niakan Kalhori, S. R., Fallah, M. and Fatehi, F. (2016). Data Mining Techniques for Patient-Centered Mobile-Based Information Systems: Applications toward Personalized Care. In: Successes and Failures in Telehealth - 7th Annual Meeting of the Australasian Telehealth Society. Successes and Failures in Telehealth 2016, Auckland, New Zealand, (56-56). 1 - 3 November 2016. Niakan Kalhori, Sharareh, Rostam Niakan Kalhori, Masoumeh and Fatehi, Farhad (2016). Developing a mobile based fuzzy expert system for diabetic retinopathy risk estimation. In: Successes and Failures in Telehealth - 7th Annual Meeting of the Australasian Telehealth Society, Auckland, New Zealand, (92-92). 1 - 3 November, 2016. Fatehi, Farhad and Collins, Ash (2016). MyOnlineClinic: A novel mobile App for telemedicine. In: Successes and Failures in Telehealth - 7th Annual Meeting of the Australasian Telehealth Society, Auckland, New Zealand, (24-24). 1 - 3 November, 2016. Mosadeghi-Nik, Mahsa, Askari, Marzyeh.s and Fatehi, Farhad (2016). Review study on mHealth for headache disorders. In: Successes and Failures in Telehealth - 7th Annual Meeting of the Australasian Telehealth Society, Auckland, New Zealand, (85-85). 1 - 3 November, 2016. Fatehi, F. and Caffery, L. (2016). Telehealth service models for Australian general practices. In: Successes and Failures in Telehealth - 7th Annual Meeting of the Australasian Telehealth Society. Successes and Failures in Telehealth 2016, Auckland, New Zealand, (23-23). 1 - 3 November 2016. Niakan Kalhori, Sharareh R., Haj-Esmaeili, Sadrieh and Fatehi, Farhad (2016). Virtual reality applications for chronic diseases care: a review study. In: Successes and Failures in Telehealth - 7th Annual Meeting of the Australasian Telehealth Society, Auckland, New Zealand, (57-57). 1 - 3 November, 2016. Valizadeh-Haghi, S. and Fatehi, F. (2015). Evaluating the Quality of the Internet Health Resources in Diabetes. In: Diabetes Technology & Therapeutics. , , (A165-A165). .
Karunanithi, Mohanraj, Abdolkhani, Robab and Fatehi, Farhad (2015). A model of mobile diabetes management system based on diabetes core dataset. In: 2015 International Conference on Successes and Failures in Telehealth (SFT-15). 2015 International Conference on Successes and Failures in Telehealth (SFT-15), Brisbane, QLD, Australia, (50). 12 - 13 November 2015. Fatehi, Farhad, Russell, Anthony W., Ding, Hang, Bird, Dominique, Karunanithi, Mohanraj and Gray, Leonard C. (2015). Design of a mobile-based diabetes management system for insulin titration in type 2 diabetes: a proof of concept study. In: 2015 International Conference on Successes and Failures in Telehealth (SFT-15). 2015 International Conference on Successes and Failures in Telehealth (SFT-15), Brisbane, QLD, Australia, (38). 12 - 13 November 2015. Bashi, Nazli, Fatehi, Farhad, Karunanithi, Mohanraj and Walters, Darren (2015). Remote monitoring of patients with heart failure: a review of systematic reviews. In: 2015 International Conference on Successes and Failures in Telehealth (SFT-15). 2015 International Conference on Successes and Failures in Telehealth (SFT-15), Brisbane, QLD, Australia, (25). 12 - 13 November 2015. Fatehi, F., Gray, L. C., Russell, A. W. and Paul, S. (2015). Validity and Reliability of Video Teleconsultation for the Management of Diabetes: a Randomized Controlled Trial. In: Abstracts from ATTD 2015 8th International Conference on Advanced Technologies and Treatments for Diabetes. 8th International Conference on Advanced Technologies and Treatments for Diabetes, Paris, France, (A119-A119). 18-21 February 2015. Fatehi, F., Armfield, N.R., Dimitrijevic, M. and Gray, L.C. (2014). Clinical applications of videoconferencing. In: International Conference on Successes and Failures in Telehealth 2014 (SFT-14), Adelaide, Australia,, (). 17-18 November 2014. Fatehi, F., Edirippulige, S. and Gray, L. C. (2013). A systematic review on the use of online support groups for improving diabetes care. In: International Conference on Successes and Failures in Telehealth 2013 (SFT-13), Brisbane, Australia, (). 12-13 November 2013. Fatehi, F., Sheehan, C., Russell, A. W. and Gray, L. C. (2013). Challenges and success factors of integrating telehealth into routine care – A case study of tele-endocrinology clinic in Queensland, Australia. In: International Conference on Successes and Failures in Telehealth 2013 (SFT-13), Brisbane, Australia, (). 12-13 November 2013. Peel, N., Sameti, S. and Fatehi, F. (2013). Internet use and seeking pregnancy related information by Iranian women. In: International Conference on Successes and Failures in Telehealth 2013 (SFT-13), Brisbane, Australia, (). 12-13 November 2013. Fatehi, F., Mohammadi, S., Russell, A.W. and Gray, L.C. (2013). Structural equation modelling of suitability of telemedicine for remote consultation of people with diabetes. In: International Conference on Successes and Failures in Telehealth 2013 (SFT-13), Brisbane, Australia, (). 12-13 November 2013. Fatehi, F., Gray, L. C. and Russell, A. W. (2013). Telemedicine for clinical management of diabetes - a process analysis of video consultations. In: International Conference on Successes and Failures in Telehealth 2013 (SFT-13), Brisbane, Australia, (). 12-13 November 2013. Fatehi, F. and Gray, L. C. (2013). The good, the bad, and the ugly of using MeSH for electronic search – A case study of PubMed search for telemedicine literature. In: International Conference on Successes and Failures in Telehealth 2013 (SFT-13), Brisbane, QLD, Australia, (). 12-13 November 2013. Fatehi, F., Mohammadi, S. and Gray, L.C. (2013). The rise and fall of Google Health - Lessons learned from a giant’s failure. In: International Conference on Successes and Failures in Telehealth 2013 (SFT-13), Brisbane, Australia, (). 12-13 November 2013. Fatehi, F. and Wootton, R. (2012). Telemedicine, telehealth or e-health?. In: Global Telehealth 2012, Sydney, Australia, (). 26-28 November 2012. Fatehi, F. (2011). Teleconsultation for Diabetes: Analysis of Conventional Diabetes Consultations. In: International Conference on Successes and Failures in Telehealth (SFT-11), Brisbane, Australia, (). 1-2 December 2011. Fatehi, Farhad (2006). Using PDA Phone for Reporting Notifiable Diseases in Yazd, Iran to Improve the Reliability and Timeliness of Aggregated Data M.Sc Thesis, Ruprecht Karls Universität Heidelberg - Department of Tropical Hygiene and Public health , Ruprecht Karls Universität Heidelberg.